My website features the best Mt. Pleasant real estate search for homes, condos, land and multi-residential properties available. It is the only site you will ever need! It is easy-to-use and updated by the official MLS database every 15 minutes. Mt. Pleasant, Ontario is situated approximately 10 kilometers south of Brantford and is a small Hamlet with a rich history. Take a leisurely stroll to enjoy the wide variety of home styles, or stop at the Windmill Country Market for lunch, or an outdoor picnic. The Scape Spa is located just down the street and was formerly a local schoolhouse. The Mt. Pleasant walking tour is a way to get to know the area with a guide that can explain the foundation of the area and the famous people who settled here. Mt. Pleasant has kept pace with the active real estate market and is home to new subdivisions as well as farm properties and Heritage homes. 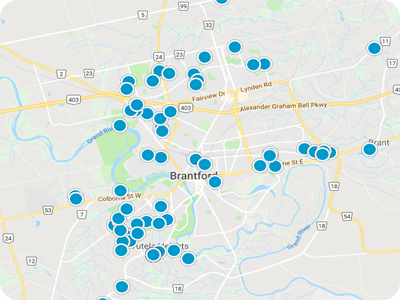 Our site Property For Sale in Brantford, provides real-time MLS Listings that are updated multiple times per day to ensure our clients are the first to know about any active listings in the Mt. Pleasant area.